Fanack Home / Syria / Past to Present / The Syrian Opposition: Who is Who? And Who is with/against Whom? Since the beginning of the popular uprising in Syria and the progressive mutation of the pro-democracy revolution into a civil conflict with regional and international ramifications, the number and types of rebel groups fighting in the country have varied greatly, from democratic and secular entities to Islamist and terrorist groups, fighting with or against one another, depending on the context. In the Syrian anti-Assad opposition as a whole, alliances between the independently operating rebel brigades have been changing constantly. There were also ambiguous relations between some rebel groups and the Syrian regime. This has led to widespread confusion among the public, in both the Arab world and in the West. With the deck of cards so thoroughly shuffled, the general perception now is that the Syrian ‘opposition’ no longer exists or that all rebels are terrorists, especially since the rise of the Islamic State. While these two perceptions are true to a certain extent, they reflect neither the complexity of the situation on the ground nor the nuances of the profile of each entity and the nature of their alliances and counter-alliances. Below are listed the main organizations in the Syrian opposition today, with their similarities and differences and their various connections. The Free Syrian Army was founded in July 2011 by a group of defected Syrian Armed Forces officers and soldiers and has always been more of a coalition of like-minded groups than a unified fighting organization. It lacks a clear command structure. The FSA coordinates with the Syrian National Council (later the Syrian National Coalition), a political body that has been recognized, since December 2011, by more than one hundred countries as representing the Syrian people. Between July 2012 and July 2013, poor discipline and infighting weakened the FSA, considered the military wing of the ‘moderate opposition’, while jihadi groups had entered northern Syria and became more effective. In fact, the growth of the al-Qaeda–allied al-Nusra Front and other Islamist groups during the first half of 2013 disillusioned thousands of FSA men who felt that their own revolution against the regime had been stolen from them. The weakening of the FSA continued in 2014 and became a paralysis in the military command in the last months of the year, before the American-led coalition revived hopes for an FSA comeback. On 25 September 2014, a coalition of moderate Muslim rebel groups fighting under the Supreme Military Council of Syria, which includes the FSA, signed an agreement with a predominantly Christian coalition called the Syriac Military Council, to unify their fight against the Assad government and ISIS/ISIL/IS. ISIS originated as Jamaat al-Tawhid wa-al-Jihad in 1999. This group was the forerunner of Tanzim Qaidat al-Jihad fi Bilad al-Rafidayn, commonly known as al-Qaeda in Iraq (AQI), a group formed by Abu Musab al-Zarqawi in 2004. AQI joined other Sunni insurgent groups to form the Mujahideen Shura Council, which consolidated further into the Islamic State of Iraq (ISI) shortly afterwards. The group’s original aim was to establish an Islamic state in the Sunni-majority regions of Iraq. Following its involvement in the Syrian Civil War, after renaming itself the Islamic State in Iraq and al-Sham (ISIS, or ISIL, for Islamic State in Iraq and the Levant), its aim expanded to include controlling Sunni-majority areas of Syria. After the fall of Mosul in early June 2014 and the subsequent conquest of vast swathes of Iraq and Syria, where the group has almost total control of al-Raqqa and Deir Ezzor provinces, a caliphate was proclaimed, with its leader, Abu Bakr al-Baghdadi, as caliph. ISIS at the same time became the Islamic State (IS). The group currently controls about 90,000 square kilometres, from western Syria to eastern Iraq, which is almost the size of Portugal. In August 2014, the Syrian Observatory for Human Rights claimed that the number of fighters in the group had passed 50,000 in Syria, while the CIA estimated in September 2014 that there were between 20,000 and 31,500 fighters in Syria and Iraq combined. Thousands of these are foreign fighters. According to the New York Times, in September 2014 there were more than 2,000 Europeans and 100 Americans among IS’s estimated 15,000 foreign fighters. Al-Nusra Front is the Syrian branch of al-Qaeda. Its leader, a self-proclaimed emir, goes by the name of Abu Mohammed al-Golani. The group released its first public statement in January 2012, in which it called for armed struggle against the Syrian regime. The structure of the group varies across Syria. In Damascus, the organization operates in an underground system of clandestine cells, while in Aleppo, the group is organized along semi-conventional military lines, with its forces divided into brigades, regiments, and platoons. It is estimated to number about 6000 fighters. The general perception of ISIS, or IS as it now calls itself, as the world’s most dangerous jihadi organization has been complicated recently by US intelligence claims of the existence of an elite al-Qaeda cell sent personally by Ayman al-Zawahiri to join al-Nusra militants inside Syria, not to fight the al-Assad regime but to plot spectacular, mass-casualty attacks on civilian targets in the West. This cell, dubbed the Khorasan Group, was said by Washington to pose a more ‘direct’ threat to the West than ISIS, but many analysts doubt the existence of such a separate group and believe they are part of al-Nusra. Ahrar al-Sham is a Salafist rebel group established in the early stages of the Syrian conflict and includes among its members Islamist prisoners released in 2011 by the Syrian regime, as well as previous al-Qaeda militants, such as its senior leader Abu Khalid al-Suri, who was then al-Qaeda’s Syria representative. The group is supported by, among others, Kuwaiti religious figures such as Sheikh Hajjaj and Shafi al-Ajami and influential politicians such as former parliamentarian Waleed al-Tabtabai. At its peak, in July 2013, Ahrar al-Sham had between 10,000 and 20,000 fighters, making it the most powerful unit fighting al-Assad under the umbrella of the Islamic Front (see below). The group was never declared a terrorist organization by the United States (unlike al-Nusra) and was seen as a bridge between the secular rebels and the extremists. On 9 September 2014, a suicide attack on a meeting in Idlib province killed Hassan Abbud, the leader of the group, and more than forty other senior commanders. 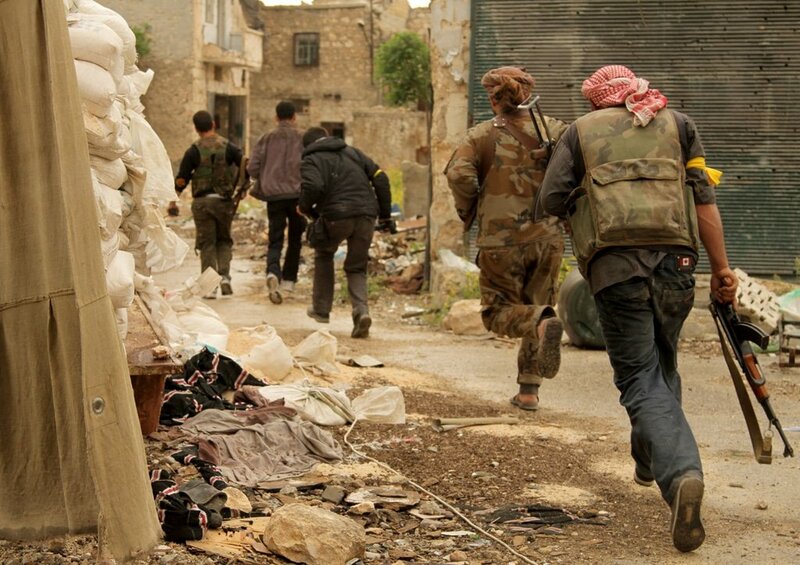 The Islamic Front, born in November 2013, is a merger of seven rebel groups involved in the Syrian civil war. Among these are Suqur al-Sham, al-Tawhid Brigade, Jaysh al-Islam, and Ahrar al-Sham. By early 2014, the Islamic Front had condemned the actions of the ISIS, and some factions within the alliance attacked it. Several IF brigades, including Suqur al-Sham and Ahrar al-Sham, developed internal divisions over how—or even whether—to confront ISIS. These divisions may be related to the suicide attack that killed prominent leaders of the Front in early September. ISIS vs. al-Nusra: What is the difference? ISIS had close links to al-Nusra Front until February 2014 when, after an eight-month power struggle, al-Nusra cut all ties to the group. In fact, al-Nusra led various military operations together with ISIS and the Salafist group, Ahrar al-Sham, before deciding to fight alone after an attempt by ISIS in April 2013 to take over the group. Its leader, Abu Mohammad al-Golani has indeed renewed his allegiance to the leader of al-Qaeda, Ayman al-Zawahiri, after the emir of ISIS, Abu Bakr al-Baghdadi, announced in April 2013 the union between the two groups. The key distinction between the two factions is one of method, as opposed to ideology or long-term objectives: al-Nusra seeks to maintain good relations with other rebel groups and local actors, whereas IS seems almost to relish conflict with them. For example, in contrast to IS’s beheading of two American journalists and one British aid worker, al-Nusra last August freed an American journalist, Peter Curtis, whom they had held for nearly two years. In early September, the group freed 45 Fijian UN peacekeepers taken hostage in the Syrian Golan Heights. In Lebanon, IS beheaded two Lebanese soldiers captured in recent clashes with the Lebanese Army in the border town of Arsal, while al-Nusra freed five captives it had taken during the battle, though it has since shot one dead and threatened to kill a second. Ideologically, however, there is no major difference. Al-Nusra is part of al-Qaeda, and al-Qaeda is dedicated, just like ISIS, to reestablishing the caliphate. The group rejects the legitimacy of IS’s declaration of a caliphate, but their goals are similar in several respects. While some in the FSA accuse al-Nusra Front and others of hijacking a revolution that began as an uprising to demand a democratic system and are worried by al-Nusra’s theocratic ideology and plans for Syria’s future, others see foreign extremists as a welcome boost to the fight against the Assad regime, bringing experience from Iraq and Afghanistan. Moaz al-Khatib, the then leader of the National Coalition for Syrian Revolutionary and Opposition Forces, called on the United States in the winter of 2012-2013 to reconsider its decision to list the al-Nusra Front as a foreign terrorist organization; al-Khatib stated that all rebel forces whose main goal is ‘the fall of the regime’ should be left unharassed. Al-Nusra, which was a great help to Syrian rebels in the battle of Aleppo early in the conflict, was classified as a terrorist organization by the United States in December 2012. In January 2014, the Daily Telegraph stated that Western intelligence sources believed that the Syrian government had made secret oil deals with ISIS and al-Nusra, claiming that the militants were funding their campaign by selling crude oil to the Assad regime from oilfields that they had captured. The Syrian authorities were accused, before they engaged in direct confrontation with ISIS, of a tacit entente with the extremist groups to weaken the other components of the opposition as well as the Kurdish forces. Until the spring of 2014, ISIS bases in fact remained mostly untouched by the Syrian army’s artillery and the Syrian air force. Despite their differences and conflicts, many moderate rebels are believed to have been assimilated into the Islamist group. In August 2014, a high-level ISIS commander said that there was no longer a FSA presence in eastern Syria, claiming that all FSA soldiers had joined the Islamic State. This is supported by a claim made by the Syrian Observatory for Human Rights that the Islamic State recruited more than 6300 fighters in July 2014 alone, many of them from the Free Syrian Army. In May 2013, Salim Idriss, the then FSA leader, acknowledged common operations with the Islamist group Ahrar al-Sham but denied any cooperation with the Islamist al-Nusra Front.